Kubotas are manufactured in Japan and are recognizable because of the orange paint job all Kubotas have. Kabota makes a wide range of tractor sizes, from compact to full-sized and over-sized models. Though Kabota tractors vary in size, the basics of operating most Kubotas are the same. To operate these tractors, you must understand how to engage the emergency brake--as well as the rear wheel brakes, and manipulate the throttle. You must also learn to operate the clutch, gears, PTO and the forearms. Operating a Kobala tractor and PTO requieres you understand the functions each lever and pedal serves. 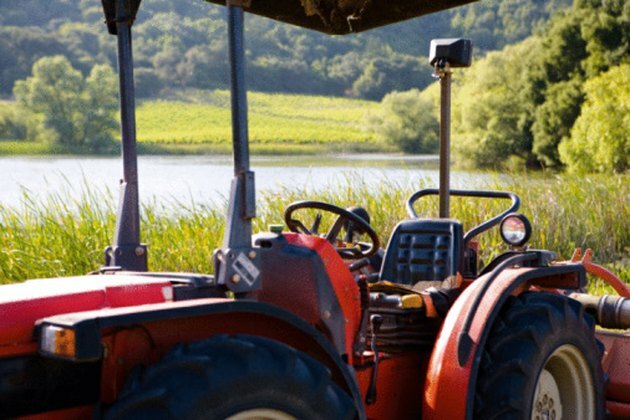 Take a seat on the Kubota and engage the emergency brake located near the right wheel well. Shift the gear box into neutral. Turn the ignition key left to warm the glow plugs. Wait for 10 or 15 seconds unless the air temperature is cold. In that case, wait half a minute or more. Turn the key right to fire the engine. Pull down on the throttle lever located to the right of the steering wheel to increase the tractor's RPM. Put your right foot on the twin rear-wheel brakes. Release the emergency brake. Lift the front forearms to lift the front attachment off the ground using the control lever attached to the tractor's forearm mounts. Pull the lever down to lift the attachment. Push the lever up to lower the forearms. Press right to dip the attachment down and press right on the lever to tilt the attachment back. Pull the lever located above the right wheel well back. This lifts the three-point hitch implement, attached to the back of the tractor, off the ground. Push the lever forward to lower the implement. Press forward on the sway arm--located on the right side of the floorboard--with your foot to advance the tractor forward. Press back on the sway arm to move the tractor in reverse. Lift the hydrostatic lever--located below the steering wheel--to set the cruise control. Depress the clutch with your foot. Push forward on the lever below the console, on the left, to shift the power-take-off (PTO) into gear. Release the clutch to engage the PTO. Press forward on the lever in front of the clutch to set the differential lock. This will engage all four wheels at once.